Herpes simplex is a common cause of sporadic acute viral encephalitis in adults. Before the introduction of acyclovir in 1984, the mortality of HSE was about 70%, which has dropped to about 16% with the use of acyclovir. HSE usually manifests as acute monophasic disease process presenting as fever, headache, and nausea followed by symptoms more suggestive of encephalitis such as hemiparesis, focal deficits, seizures, altered level of consciousness and behavioral changes. However, subacute or chronic presentations of HSE are rarely described in literature.,,, Early recognition and treatment are important in reducing the morbidity and mortality of HSE. Untreated HSE is associated with high mortality rate of 50%–70%. Here, we are reporting a rare case of subacute HSE presented with on and off history of fever, headache, forgetfulness, and disorientation for the past 1 month. A 32-year-old man presented to the neurology clinic of tertiary center of the northeastern part of India with the complaints of intermittent midgrade fever, headache, cognitive decline in the form of forgetfulness of immediate and recent past and disorientation of place and person for the past 1 month. On examination, the patient was febrile (100.4 F), conscious but not oriented to place and person and there was impairment of immediate and recent memory. Mini-Mental State Examination (MMSE) score was 19/30 (orientation to time - 5/5, orientation to place - 1/5, registration - 3/3, attention or calculation - 1/5, recall - 0/3, and language - 9/9). Assessment using the neuropsychology battery NORMS 2009 also showed impairment of frontal and temporal lobes. There was no evidence of focal neurological deficit and signs of meningeal irritation. All routine investigations including complete blood count, blood chemistry, and urine routine examination were normal. Hepatitis B surface antigen, anti-HCV-Ab, and retro-Ab tests were negative. Antinuclear antibody, anti-double-stranded DNA antibody, and scrub typhus antibody were negative. MRI brain with contrast showed nonenhancing symmetrical T2 and FLAIR hyperintensities in medial temporal lobes [Figure 1]a and [Figure 1]b. Electroencephalogram showed no abnormalities. Cerebrospinal fluid analysis (CSF) revealed protein level 84 mg/dL, glucose 51 mg/dL (the synchronous serum value was 110 mg/dL), total cell count of 20 (all lymphocytes), without red blood cells, CSF Indian ink, acid-fast bacilli were negative and CSF bacterial and fungal cultures were sterile. CSF polymerase chain reaction (PCR) for herpes simplex virus (HSV) was positive for HSV-1 DNA. In view of persistent cognitive impairment, CSF fluid findings suggestive of ongoing chronic inflammation with altered signal changes in MRI in medial temporal lobes and positive HSV DNA PCR a diagnosis of Sub-acute herpes encephalitis was made. The patient was started on Acyclovir (10 mg intravenous thrice daily) and continued for 14 days. Within 1 week of starting acyclovir patients general well-being improved, he was more energetic with a good appetite. The patient was monitored with serial MMSE scoring. He was discharged after 14 days of treatment with injection Acyclovir and repeat MMSE score at the time of discharge showed improvement to 22/30 (orientation to time - 5/5, orientation to place - 1/5, registration - 3/3, attention or calculation - 3/5, recall - 1/3, and language - 9/9). The MMSE score on follow-up after 2 weeks was 27/30 (orientation to time - 5/5, orientation to place - 5/5, registration - 3/3, attention or calculation - 2/5, recall - 3/3, and language - 9/9). The patient is still under follow-up and doing well and joined his job. Subacute and chronic presentations of HSV encephalitis are rarely described in literature. 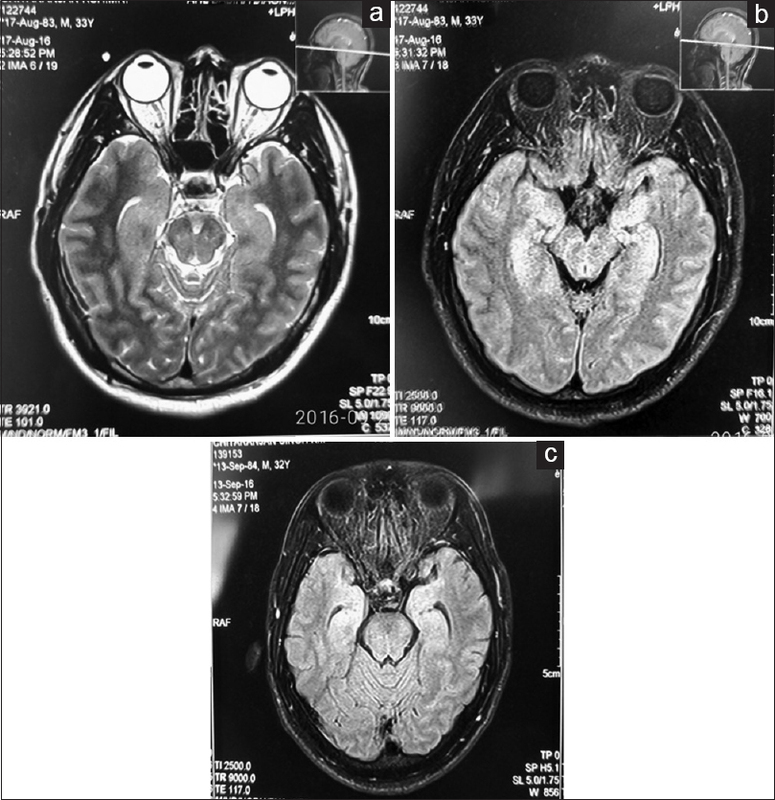 A case report of chronic persistent temporal lobe encephalitis following genital herpes by HSV-2 resulted in intractable partial complex seizure which necessitated temporal lobectomy. Immunohistochemistry of resected temporal lobe confirmed HSV2 infection. Postoperative exacerbation of seizures was resistant to drugs and could be controlled after acyclovir therapy. Other atypical presentations in HSV encephalitis in the form of slow mentation, poor memory, etc., had been described in patients HIV and HSV encephalitis. In both the above case scenarios, atypical acute and subacute course of HSV were contributed due to immunosuppression from underlying disease process. Yamada et al. Described a case of a 66-year-old immunocompetent man with a history of progressive hemiparesis, cognitive decline, and brain atrophy over the 9.5-year period after HSE who later died due to pneumonia. Autopsy confirmed active encephalitis. HSV1 antigen was detected by immunohistochemistry, HSV-1 DNA by in situ hybridization and herpes virus nucleocapsid by electron microscopy. These findings were attributed to chronic progressive viral damage to brain parenchyma through viral persistence in brain. All these case reports confirm the presence of a subacute or chronic form of HSV encephalitis which can present with variable clinical features extending form progressive cognitive decline, intractable seizures, and focal nuerological deficits. Our patient had low-grade fever and progressively declining cognitive functions pointing toward an ongoing damage to concerned neurons although in milder form or slow progression. For the diagnosis of HSV encephalitis (acute, subacute, or chronic) currently, real-time PCR is the gold standard with 95% sensitivity and 90% specificity. MRI also plays an important role in the diagnosis of suspected HSE with more than 90% of PCR-proven HSV encephalitis cases have abnormal MRI findings including increased T2 and decreased T1 signals in the temporal lobes. Our patients had involvement of median temporal lobe bilaterally with improvement in imaging findings after completion of 14 days of acyclovir therapy [Figure 1]c. In conclusion, this case of HSE had subacute course with a progressive cognitive impairment which is very atypical. The clinical features such as low-grade fever, decreased appetite, mild headache, and cognitive functions all improved significantly with 14 days of acyclovir. The improvement started with few days of starting therapy and documented through MMSE scale score and general well-being. At the end of therapy, there was a significant improvement in MMSE score and repeat MRI also showed an improved picture. This case highlights the importance of early recognition of atypical subacute course of HSV encephalitis. Early recognition and treatment with acyclovir therapy can result in almost complete recovery of neurological features. Cinque P, Cleator GM, Weber T, Monteyne P, Sindic CJ, van Loon AM. The role of laboratory investigation in the diagnosis and management of patients with suspected herpes simplex encephalitis: A consensus report. The EU Concerted Action on Virus Meningitis and Encephalitis. J Neurol Neurosurg Psychiatry 1996;61:339-45. Grover D, Newsholme W, Brink N, Manji H, Miller R. Herpes simplex virus infection of the central nervous system in human immunodeficiency virus-type 1-infected patients. Int J STD AIDS 2004;15:597-600. Yamada S, Kameyama T, Nagaya S, Hashizume Y, Yoshida M. Relapsing herpes simplex encephalitis: Pathological confirmation of viral reactivation. J Neurol Neurosurg Psychiatry 2003;74:262-4. Cornford ME, McCormick GF. Adult-onset temporal lobe epilepsy associated with smoldering herpes simplex 2 infection. Neurology 1997;48:425-30. Wasay M, Mekan SF, Khelaeni B, Saeed Z, Hassan A, Cheema Z, et al. Extra temporal involvement in herpes simplex encephalitis. Eur J Neurol 2005;12:475-9. Avkan Oguz V, Yapar N, Sezak N, Alp Cavus S, Kuruüzüm Z, Sayiner A, et al. Two cases of herpes encephalitis with normal cerebrospinal fluid findings. Mikrobiyol Bul 2006;40:93-8.